Could Aurora Cannabis Inc (TSE:ACB) (OTCQB:ACBFF) (FRA:21P) be making an imminent play for MedReleaf Corp (TSE:LEAF) (OTCMKTS:MEDFF)? According to inside sources, that may well be the case. As reported by The Globe And Mail (paywall enabled) post-noon today, MedReleaf has contacted several large companies regarding a possible sale. However, the most serious discussions involve Aurora Cannabis, according to anonymous sources citing the private nature of the talks. If true, this would be an absolute bombshell for the company which just 20-weeks ago cemented the biggest marijuana merger in industry history. Of course, we’re talking about the $1 billion-plus merger with CanniMed Therapeutics. That acquisition already vaulted Aurora Cannabis into medical cannabis leadership position by giving access to CanniMed’s sophisticated quality control laboratories, Tier-1 productions facilities, and proprietary high-performance liquid chromatography methodology. They also picked up an extra 97,000 feet in medical grow capacity. Should the company scoop up rival MedReleaf, it would integrate the biggest remaining pure-play medical cannabis company into Aurora’s deep therapeutic portfolio. Aside from the extra 140,000 kilograms per year in fully funded production capacity MedReleaf provides, Aurora gains perhaps the North American leader in medical refined goods—where the highest margins are expected to be. The extra grow capacity could also be partially funneled into the recreational side, should post-legalization shortages crop up. Ultimately, the acquisition would give the company absolute dominant pole-position as far as the medical refined cannabis market is concerned. It would check off all the boxes in terms of scale, cost, distributions and prestige advantages versus the rest of the field. In might be a stretch to call it “cornering” the market, but their closest competitor would certainly be a distant second. Again, it’s worth noting that a Aurora Cannabis-MedReleaf merger is far from a done deal. MedReleaf is engaged in purported talks with multiple entities, includes solicitations of both Canopy Growth Corp. and Aphria Inc. At this stage, anything could happen (as we saw when Aurora Cannabis acquisition intentions with Newstrike Resources Ltd. fell apart in the latter stages). But it does sound like MedReleaf wishes to partner up—at the right price. Whether this is simply a strategic opportunity coming together, or acute strategy to swallow up as many formidable assets prior to Canadian marijuana legalization is unclear. However, if the reports are true, it exemplifies how aggressive Aurora Cannabis management has been towards becoming the top chieftain. There’s certainly nothing conservative or middling in their approach to do so. At MedReleaf’s current market capitalization of approx. $2.2 billion, the acquisition cost would be at least double the size of the CanniMed’s price tag in January. Of course, this excludes the likely premium, which could push ultimate price northward of $3 billion. 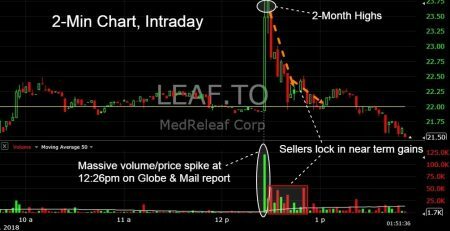 MedReleaf shares are currently trading down ↓$0.53 to $21.75 (↓2.38%). Upon dissemination of the report, the company $23.75/share before pulling back. With the incessant run LEAF has undertaken over the past month, profit takers seized on the opportunity. Aurora Cannabis is currently trading up $0.16 to $8.04/share (↑2.03%). Prices have pulled back around twenty cents following the leak. Midas Letter will be following the story in earnest as further information warrants.